Swami Sivananda was an extraordinary man who ignited the flame of spirituality, love and generosity in all those he met by his mere presence. On the 8th of September of 1887 in Pattamadai – in a small village near the Tamraparani river in South India, a baby was born to a very humble family. The baby, who would one day become Swami Sivananda Saraswati, was named Kuppuswamy. It soon become obvious that Kuppuswamy was exceptional. His extraordinary qualities revealed themselves in his thoughts, words and actions from a very young age. He had an innocent playfulness about him, which he matched with a mighty spirit of compassion, renunciation and sense of dharma – moral duty. As a child, Kuppuswamy would unfailingly collect flowers for the daily oblations. He wholeheartedly shared his food with friends and those less fortunate. And would urge his father to never turn away anyone who came seeking for alms empty-handed. He excelled in his studies and undertook several after-school activities such as drama, singing and debate. His pursuit of knowledge and his passion for helping others led him to a career in medicine. Kuppuswamy settled in Malasia, where he worked as a doctor. His growing reputation for providing free treatment to the underprivileged resulted in a big promotion. He was appointed director of the Hospital. He was known to send his poorest patients home with enough pocket money to make up for lost wages and pay for the medicines he prescribed. He considered his work a highly spiritual activity, to him serving others was equivalent to serving the divine. He was a Karma Yogi before he even realised. Kuppuswamy would receive many gifts for his treatments – mainly from his wealthier patients. He would share the gifts with the rest of his patients with great enthusiasm. On one occasion, he was given a book by Swami Satchidananda called Jiva Brahma Aikyam – The Identity of Soul and God. The book became a turning point in his life. It sparked his inner flame; he became a voracious reader of spiritual literature and included yoga into his daily routine. Kuppuswamy started to develop a feeling that medicine healed only on a superficial level. The feeling of having a higher calling – which had always prowled in his mind – become prominent. He needed more. The young doctor left his practice and headed back to India, where he would follow the path of sages and renunciates, in search of the ultimate truth. Kuppuswamy reached Madras – Present day Chennai. Leaving all his possesions with a friend, he embarked on a pilgrimage to find his higher calling. He left for Varanasi, where he visited many temples and great sages, culminating his pilgrimage in Rishikesh. In Rishikesh, he met Swami Vishwananda Saraswati, a yogi belonging to the Sringeri Matha – a monastery established by Adi Sankaracharya in the 18th century. Kuppuswamy knew he had found his guru; he was sure Swami Vishwananda could lead him towards the path of self-realisation. Swami Vishwananda too recognised a pure heart and a divine soul. 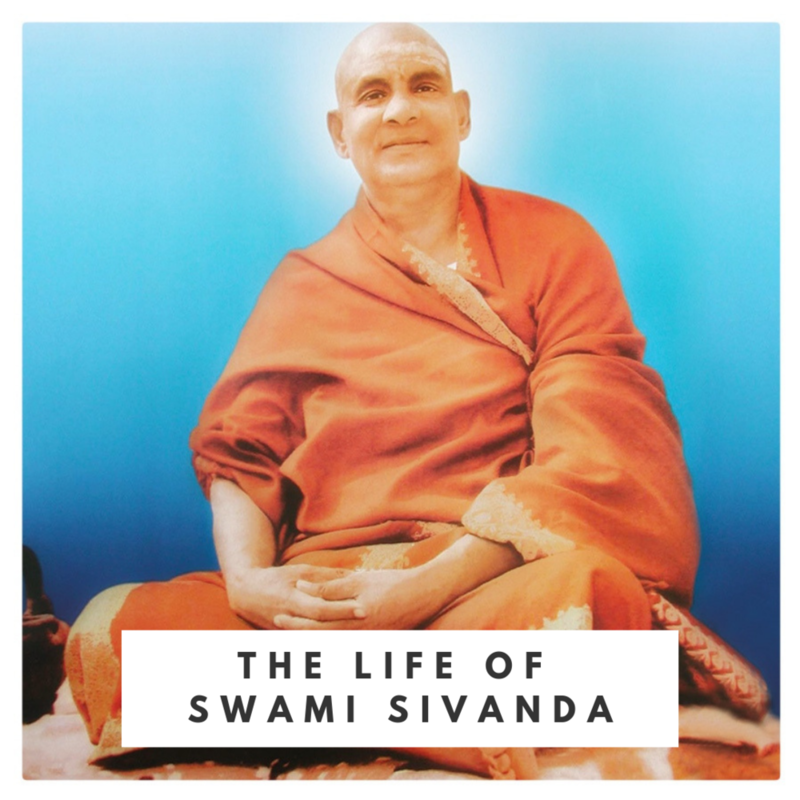 The doctor’s initiation into sannyasa – renunciation – followed shortly after and he was named Swami Sivananda Saraswati. Swami Sivananda Saraswati – now a renunciate, took refuge in a small hut. Now a renunciate, he would with moderation, slept on the floor and practiced intense Tapasya – austerities. He would practice several hours of meditation a day and chant mantras in hip-deep water. Meditation, yoga, reading and serving the needy became a part of his daily schedule. He never missed an opportunity to treat the underprivileged and fellow renunciates. He would cleanse, feed, clothe, and medicate them; sometimes even begged food for them. In 1927, he initiated a dispensary to serve pilgrims, fellow renunciates and the needy for free. After years of intense tapasya and selfless service, he finally attained enlightenment; superconsciousness. After his enlightenment, he embarked on a great journey throughout India. He visited important places of pilgrimage and renowned spiritual leaders such as Sri Ramana Maharishi and Maharishi Suddhananda Bharati. Once his journey finalised, he returned to Rishikesh to stay in an abandoned cowshed by the banks of the Ganges river with his devotees. He taught yoga and spiritual philosophy to all those who sought his guidance. The number of disciples gradually increased and in 1936 Swami Sivananda Saraswati founded the Divine Life Society. The small society that was founded in an abandoned cowshed became a global organisation with many branches worldwide. The society had two main objectives – to serve humanity and to spread spiritual knowledge. Swami Sivananda Saraswati was a prolific writer; he wrote several books on various topics related to Yoga and spirituality. As his following grew further and the number of disciples increased day after day, he initiated various programs to serve the poor, help the needy, and uplift the vulnerable. He advocated the practices of compassion, mercy, love and forgiveness towards all beings. To spread this message, the monthly journal of The Divine Life society was commenced. As a former doctor, his passion for alleviating the suffering of others was strong. He believed the ancient healing system of Ayurveda had much to offer, which led him to create the Sivananda Ayurvedic Pharmacy. The society expanded and many organisations were established. The dispensary grew into a full-fledged hospital after which an eye hospital was founded. In 1963, Swami Sivananda Saraswati attained Mahasamadhi – the highest form of Samadhi, referring to the departure from the body of a realised soul by meditation.